Make a donation today and make a lasting impact on the life of a child. At Teresita Pines we feel there should be nothing standing in the way of kids having an amazing camp experience. ‘Accessibility to all’ also means financial accessibility. We want to make sure that every child has the chance to go to camp and leave with the skills, confidence and friendships that will last them a lifetime. Each year we offer ‘Camperships’ (Camper Scholarships) to children whose family can’t afford camp. 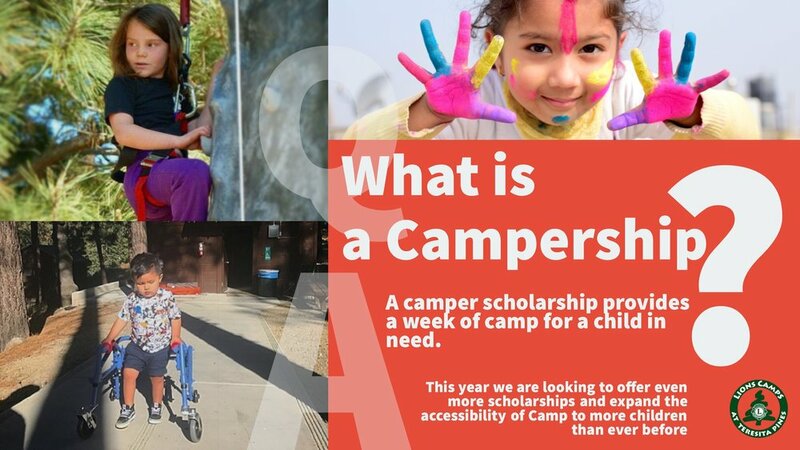 This year we are looking to offer even more scholarships and expand the accessibility and fun of going to camp to more children with disabilities. Your help can surely make Teresita Pines accessible to all. Please consider donating today. 100% of your donation is tax-deductible. Please consider to donate $10, $25, $50 or more. Every bit helps!